Not convinced? The gas well requires no subsidy – in fact it pays a hefty tax – whereas the wind turbines cost you plenty on your electricity bill. Wind power costs three times more than gas-fired power. Make that nine times for an offshore wind farm. And that still leaves out the cost of decommissioning the wind farm – few will last 25 years. And when the wind stops? Decided yet? I forgot to mention something. If you choose the gas well, that’s it, you can have it. If you choose the wind farm, you still need the gas well. That’s because you need a back-up power station running on something more reliable. You say gas is running out? It’s not. Till five years ago gas was the fuel everybody thought would run out before oil and coal. America was getting so worried even Alan Greenspan told it to start building gas import terminals, which it did. They are now being mothballed, or turned into export terminals. A chap called George Mitchell turned the gas industry on its head. Using just the right combination of horizontal drilling and hydraulic fracturing (fracking) – both well-established technologies — he worked out how to get gas out of shale where most of it is, rather than just out of (conventional) porous rocks, where it sometimes pools. The Barnett shale in Texas, where Mitchell worked, turned into one of the biggest gas reserves in America. Then the Haynesville shale in Louisiana dwarfed it. The Marcellus shale mainly in Pennsylvania then trumped that with a barely believable 500 trillion cubic feet of gas, as big as any oil field ever found, on the doorstep of the biggest market in the world. 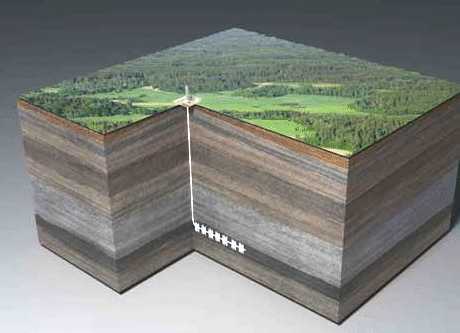 Shale gas extraction, showing horizontal drilling through the shale, followed by fracking to let the gas flow. The impact of shale gas in America is already huge. Gas prices have decoupled from oil prices and are half what they are in Europe. Chemical companies, which use gas as a feedstock, are rushing back from the Persian Gulf to the Gulf of Mexico. Cities are converting their bus fleets to gas. Coal projects are being shelved, nuclear ones abandoned. Rural Pennsylvania is being transformed by the royalties that shale gas pays (Lancashire take note). Drive around the hills near Pittsburgh and you see new fences, repainted barns and, in the local towns, thriving car dealerships and upmarket shops. The one thing you barely see is gas rigs. The one I visited was hidden in a hollow in the woods, invisible till I came round the last corner. Drilling rigs are on site for about five weeks, fracking trucks a few weeks after that, and when they are gone all that is left is a “Christmas tree” wellhead and a few small storage tanks. The International Energy Agency reckons there is quarter of a millennium’s worth of cheap shale gas in the world. A company called Cuadrilla drilled a hole in Blackpool, hoping to find a few trillion cubic feet of gas. Last month it announced 200 trillion cubic feet, nearly half the size of the giant Marcellus field. That’s enough to keep the entire British economy going for many decades. And it’s just the first field to have been drilled. Jesse Ausubel is a soft-spoken academic ecologist at Rockefeller University in New York, not given to hyperbole. So when I asked him about the future of gas, I was surprised by the strength of his reply. “It’s unstoppable,” he says simply. Gas, he says, will be the world’s dominant fuel for most of the next century. Coal and renewables will have to give way, while oil is used mainly for transport. Even nuclear may have to wait in the wings. And he is not even talking mainly about shale gas. He reckons a still bigger story is waiting to be told about offshore gas from the so-called cold seeps around the continental margins. Israel has made a huge find and is planning a pipeline to Greece, to the irritation of the Turks. The Brazilians are striking it rich. The Gulf of Guinea is hot. Even our own Rockall Bank looks promising. Ausubel thinks that much of this gas is not even “fossil” fuel, but ancient methane from the universe that was trapped deep in the earth’s rocks – like the methane that forms lakes on Titan, one of Saturn’s moons. Little wonder a furious attempt to blacken shale gas’s reputation is under way, driven by an unlikely alliance of big green, big coal, big nuclear and conventional gas producers. The environmental objections to shale gas are almost comically fabricated or exaggerated. Hydraulic fracturing or fracking uses 99.86% water and sand, the rest being a dilute solution of a few chemicals of the kind you find beneath your kitchen sink. Our political masters are still insisting that the future belongs to renewables. They are still signing contracts on your behalf guaranteeing huge incomes to landowners and power companies, and guaranteeing thereby the destruction of landscapes and jobs. The government’s “green” subsidies are costing the average small business £250,000 a year. That’s ten jobs per firm. Making energy cheap is – as the industrial revolution proved – the quickest way to create jobs; making it expensive is the quickest way to lose them. To persist with a policy of pursuing subsidized renewable energy in the midst of a terrible recession, at a time when vast reserves of cheap low-carbon gas have suddenly become available, is so perverse it borders on the insane. Nothing but bureaucratic inertia and vested interest can explain it. How about New Zealand then? Is anyone looking over here? It thought the web server would implode! He gets a pasting in the comments though. It’s also worth mentioning that “frakking” (i.e fracturing of rock extract oil and gas) is a technique that has been in use in oil drilling as well as shale gas. This has been in use for decades. Coincidentally, the NZCSC had a contribution that addresses your question. I’ve posted it as a separate article. Why the hell did the Huffington Post give Conrad Black (or any other writer known to be sane and sound) access to its columns? I understand it was recently acquired by AOL which wants to become a leading media site. Perhaps they have taken an editorial decision that the world outside academia is worth more to their hoped-for advertisers? Also, it’s good to see Black bouncing back from his undeserved travails. A landmark British investigation into fracking has concluded that the controversial practice is safe with little risk to health and the environment. The review, by the Royal Society and the Royal Academy of Engineering, says fracking can be managed effectively in Britain – as long as operational best practices are implemented and enforced through regulation.